Chiang Mai is Thailand’s shining star of the north, full of culture and the means to help tourists take some of that culture home with them. 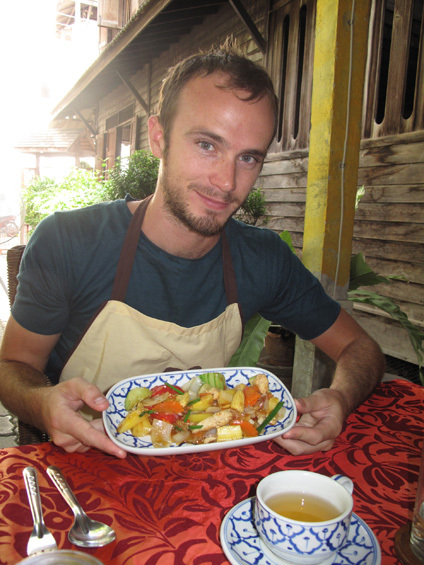 From a wealth of options, we chose to take a Thai cooking class and over the course of the five-hour session we learned to make some of our favorite Thai dishes. 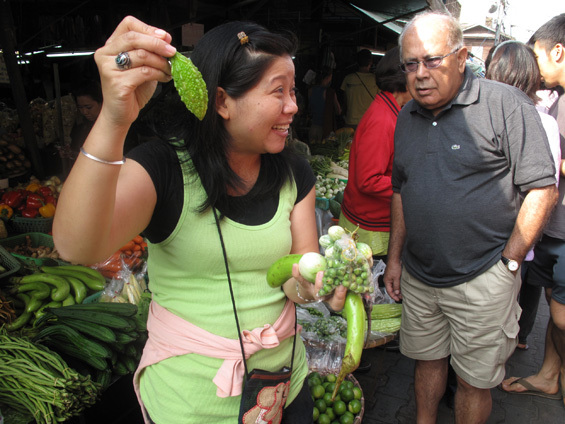 We started the day at a local market where we learned about all the ingredients we would be working with during the class. I thought it fascinating that Thailand is home to five types of eggplant, (none of which resemble the deep purple vegetable we’re familiar with in The States), and nearly as many types of basil and ginger. We learned about the variety of rice quality from the expensive good stuff to cheaper broken grains that serve as animal feed, all available in heaping quantities. Tom Yam Kung. 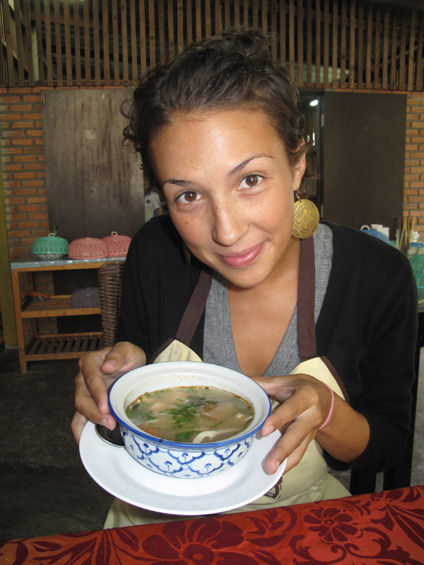 A spicy, sour soup with mushrooms, onions, tomatoes, and shrimp in a chicken broth flavored with lemongrass, chili, lime, ginger, and onions. This was my absolute favorite dish, but over the past few weeks I ate it one too many times and lost interest. Phat Thai. Thailand’s national dish, and usually one of the cheapest on any menu in Thailand. Needless to say, we’ve eaten our fair share of the thick, flat rice noodles stir-fried with egg, green onions, chicken, tofu, and bean sprouts finished with a squeeze of lime. Sweet and Sour Chicken. Tasty, sweet chicken dish served with a variety of veggies and pineapple (the best part). This was Nate’s favorite until he discovered chicken with cashew nuts. Red and Green Curry. In addition to stirring up these spicy, tangy curries, we learned to make the paste, which calls for muscles and patience as you mash the pestle hard into the mortar to achieve the right consistency — the louder and harder you bang the better. Evidently, by listening to a woman make a curry paste you could tell if she would be a good wife. Red curry quickly replaced my obsession with Tom Yam. Sticky Rice with Mango. This is so delicious. 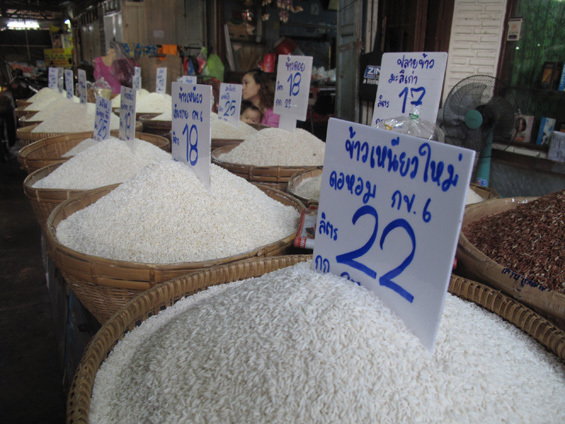 Sticky rice is found mostly in the north of this region, through Northern Thailand, Laos, Vietnam, etc. The grains are larger than traditional rice and stick together more strongly. When eaten not in this dessert form, you pick up small handfuls from a bamboo basket, work it into a ball and dip it into what ever you’re eating. For this dish you heat already cooked sticky rice with coconut milk and a dash of salt (which makes all the difference) and serve with mangoes. So simple and so yummy. There were a few more dishes, including spring rolls, papaya salad, minced chicken salad, and pumpkin with coconut milk. I would highly recommend the Smart Cook School that conducted our class. Our teacher was very informative and cheerful, constantly smiling. You can see the photos they took of our class here. There are loads of Buddhist temples in Chiang Mai, and at least one of them has a program called “Monk Chat” where during certain hours you can go hang out with monks and ask them questions about Buddhism while they practice their English. We sat down with a monk named Nan at a small, round table with basic cement benches. Over the two hours we were there, I squirmed constantly while Nan sat with his legs crossed calmly, his bright orange robe draped over one shoulder. Nate and I had loads of questions about monk-life and we learned a great deal about Nan and other monks during our conversation. Nan’s most prized possession is a pencil that he uses for his studies – his parents gave it to him two years ago. His parents also provided him with mobile phone, though he insists that he is only borrowing it from them because with possessions comes attachment. As a perfect illustration of a Buddhist teaching he discussed with us, I watched as an ant fell from a tree and landed on his arm. He felt the ant and looked at it, but left it there as not to hurt it. As he explained, even though the ant is very small, it is a living thing that must be respected just as a larger living thing such as a tiger. We talked as the sun descended and though I’d like to think we helped Nan with his English, he spoke very well and I’m sure we gained far more from this experience than he did. With many of our questions about Buddhism and monk-life answered, we left together and our studious monk hurried off for evening prayer at his home temple.